Benington (blue) v Skegness Town Res (red). Josh Meadows (blue), Devon Ainscow (red). 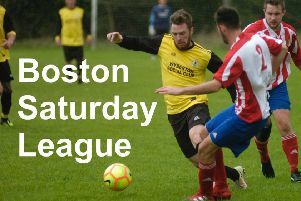 In-form Benington Reserves secured a 5-2 home win against Skegness Town A in the Boston Saturday League. The two sides competed in a Workforce Unlimited Premier Division match. Benington (blue) v Skegness Town Res (red). George Dix (blue), Jordon Turner (red). David Dawson was there to capture the action. Benington (blue) v Skegness Town Res (red). Jamie Lawson (blue), Corran Pendrigh (red). Benington (blue) v Skegness Town Res (red). Jamie Lawson (blue), Ben Firth (red).